On April 25 2018, FRESCO and Elastos are pleased to announce a global strategic partnership. 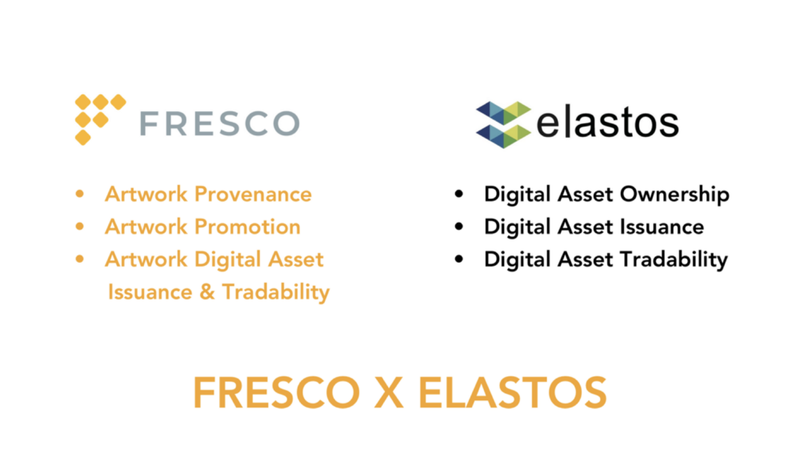 As the first blockchain art digital asset network in the world, FRESCO will become one of the first DApps in Elastos’ ecosystem. Both sides will cooperate closely in blockchain, smart contracts, and the construction of P2P networks, to create a new future for the development of the global art market. Fresco is delighted to work with Elastos side by side seeing the advent of the revolution in art and technology. 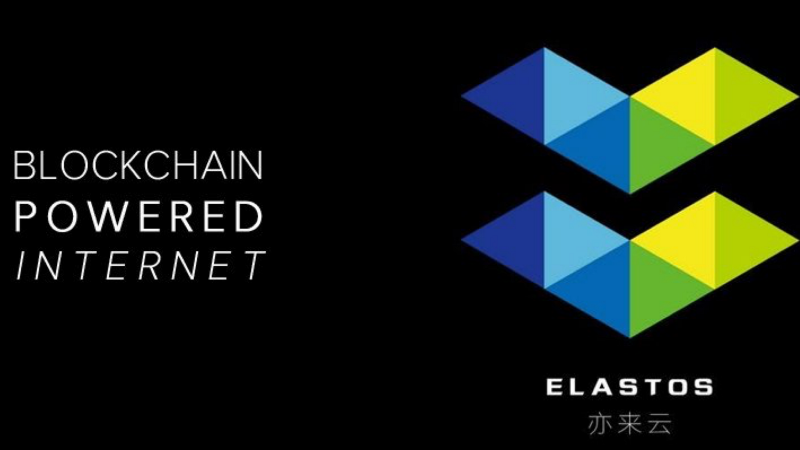 Elastos was founded by Chen Rong and Han Feng, who’re pioneers in the global blockchain industry. It’s the first operating system that can pass blockchain’s credibility to user’s day-to-day scenes in the world. With blockchain as the credible foundation, combined with Elastos’ sandbox isolation mechanism and network isolation mechanism, digital assets can be identified, made scarce, trade-able and consumable so everyone can own digital assets and profit from it, in order to make the internet a smart economic-ecological sphere. Elastos can protect digital content and user’s privacy from being compromised, leaked, or stolen. And blockchain can issue ID (warrants) for digital content to confirm the property rights and transactions. The two combined can provide the economic foundation of “private property rights” for the Internet in the information age. Only on the basis of clear property rights can we develop the economy and productive forces. Han Feng, one of Elastos’ founders, is a lifetime member of the Bitcoin Foundation, the author of “Blockchain: Quantum Wealth View”, the General Secretary of the Asian Blockchain DACA Association, and the Chinese partner of the United States Oracle Education Foundation. He also had served as the head of one of Tsinghua University’s key projects. Chen Rong is the founder/planner of the Elastos project. He has 8 years working experience in Microsoft’s operating system team. He’s been working on the research & development of operating systems since 2000. Elastos has established strategic partnerships with Bitmain and NEO. It’s highly popular in the international society. Elastos is also in the process of negotiations with companies from USA, UK, and Japan. FRESCO is the world’s first blockchain art digital asset network. 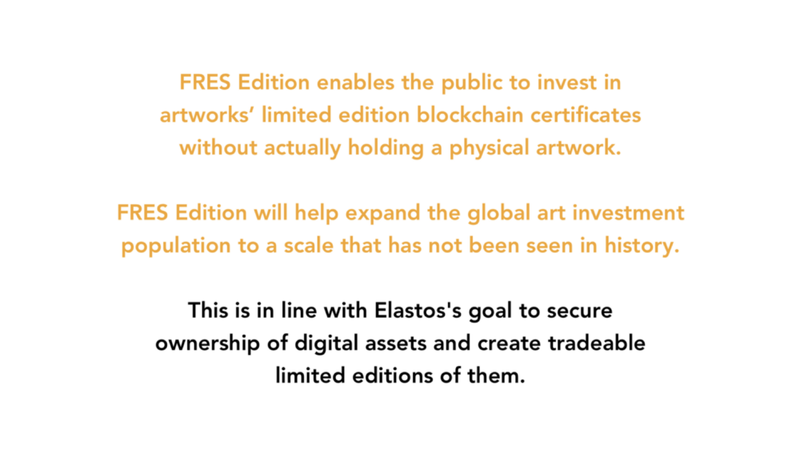 Through blockchain technology and Elastos’ operating system, FRESCO enables liquidation, promotion, and provenance of artworks at a global scale. FRESCO mainly consists of FRES artwork trust value (FRES Trust) and FRES artwork blockchain digital copyright (FRES Edition). 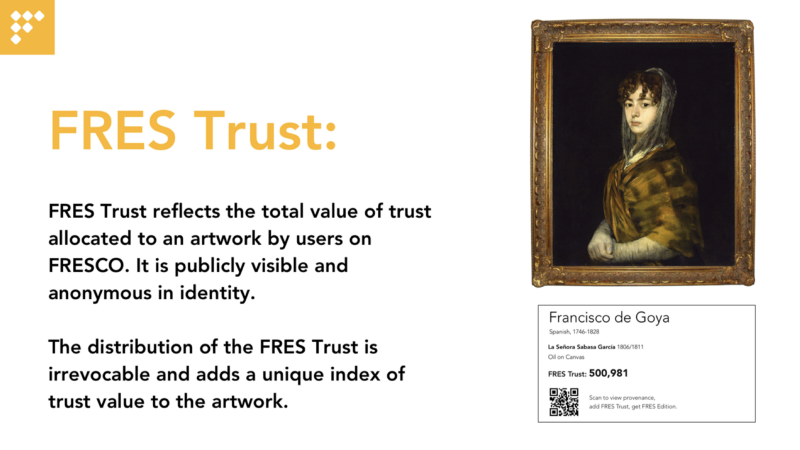 FRES Trust is a blockchain-based art value measurement system. FRES Edition is the limited digital assets copyright issued by artwork holders on FRESCO platform. FRESCO is launching the world’s first ICD (Initial Coin Distribution), distributing 300 million FRESCO tokens to the global community free of charge. Through this process, FRESCO will enable nearly 150,000 people to learn and understand the art world. This is something even world’s leading art institutions can’t achieve. Through FRES Trust and FRES Edition, FRESCO manages to expand the art investment population to the whole world and therefore pushes the art market to an unprecedented level. Elastos enables the digital assets to be published while carrying blockchain’s credibility value. This is consistent with the mission of FRES Trust. 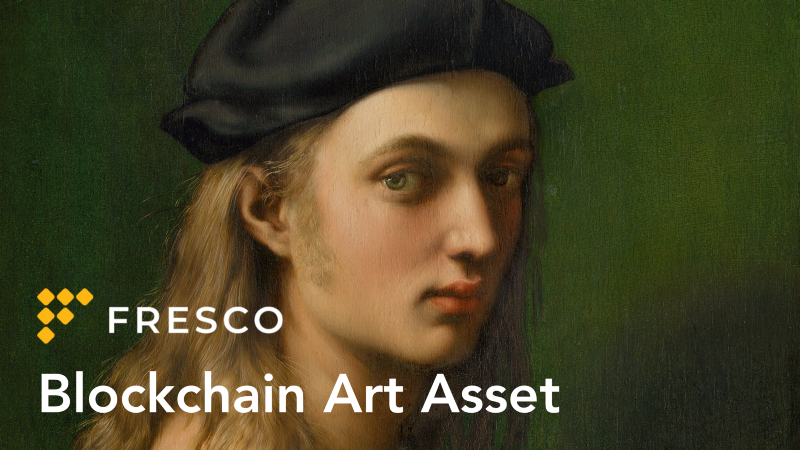 Through the irreversible process of adding tokens to artworks, FRES Trust can establish an artwork holder’s record documenting a certain artwork’s transaction history (Artwork Provenance) as well as being a decentralized and clear index of an artwork’s market and academic value without revealing the artwork’s market place. This is particularly important in the art world where most artworks’ value is multi-dimensional and art transactions are based upon negotiation. At the same time, FRES Trust will be the foundation of the FRES artwork blockchain digital copyright (FRES Edition). An artwork’s total volume of FRES Trust is the total value of FRES Edition. Elastos helps identify the digital assets to make a solid foundation for turning data into assets. Elastos enables digital assets to release limited editions and be tradable. This is the technical foundation to achieve FRES Edition as well as the economic foundation to provide “private property rights” for the internet in the information age. Fundamentally, FRES Edition is highly consistent with Elastos in terms of the view of data wealth. Through Elastos, the collection of artworks will not only be limited to physical artwork or obscure artworks. Instead, it has been expanded to the blockchain digital asset copyrights of world-famous artists’ works, which can lower the art investment threshold without affecting the physical art transactions. And it’ll bring geometric growth to the art market. 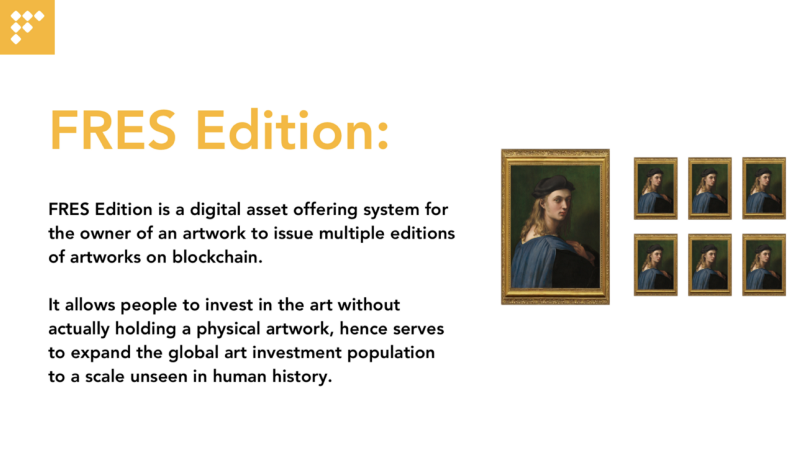 At the same time, based on Elastos, FRES Edition allow museums to build a more interactive model that enables visitors to not only take pictures with museum collections but also get a digital copy of a certain masterpiece’s blockchain digital copyright.